More info:14 days in-country. Price includes: accommodation; throughout guide; domestic flights/transport; entrance fees (Ngapali beach not suitable during the coastal rains of June-September, we can tailor the tour accordingly if you travel at this time). 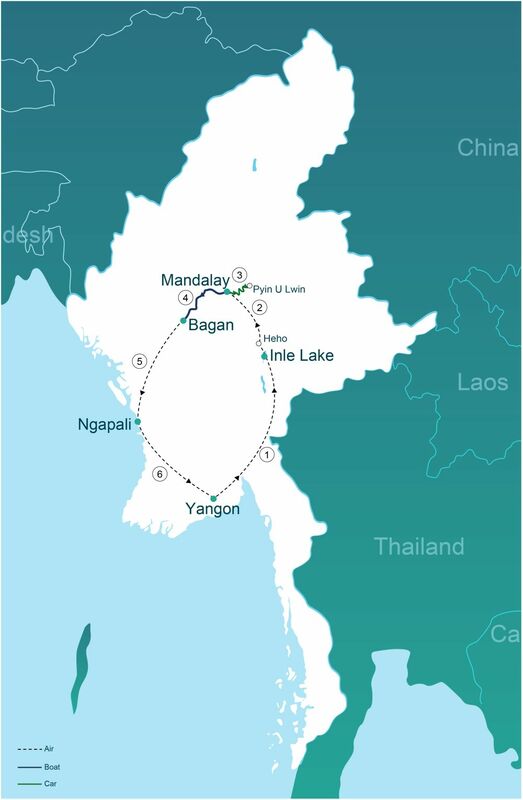 Our itineraries are conceived with the preservation of Myanmar’s natural environment and cultural heritage in mind: tourism here is in its early stages of development, and many locals who work in tourism are not familiar with sustainable tourism practices; we therefore make it our responsibility to educate and train our staff and suppliers on matters such as littering, recycling and energy saving initiatives. We also distribute the official ‘Dos and Don’ts for tourists’ booklet to all our customers, which details how you can visit the country responsibly. - Yangon is home to the largest collection of colonial-era heritage buildings in Southeast Asia. We highlight the historical importance of these buildings and the need to preserve them through the hard work of organisations such as the Yangon Heritage Trust and Torquise Mountain. - Burmese cats have recently been re-introduced to the country at Inle Lake. On this tour, we take visitors to the Inthar Heritage House, where this rare breed, long lost from its natural home, is now being nurtured. - In Pyin Oo Lwin, we visit the botanical gardens, where rare fauna and flora are preserved, and take a traditional horse and cart tour the heritage mansions, reducing our carbon footprint whilst touring this hill town. - On our journey from Bagan to Mount Popa, we visit a rural, locally-owned and run toddy and jaggery (cane sugar sweet) shop and factory. Using traditional, sustainable farming techniques, purchasing products here supports the local economy and preserves the local environment. - Contribute money and donations to disaster relief when it is called for, recently donating to flood relief in Sagaing Division. - Work with guides, suppliers and accommodation providers to reduce environmental impact in areas such as recycling and re-use of towels and bedclothes on a day-to-day basis. Myanmar is changing fast, but remains one of Southeast Asia’s poorest countries. As a locally-owned company employing mostly local staff, we know that responsible tourism is a route to economic development and better education and healthcare for many underprivileged communities throughout the country. - A visit to Myanmar’s first community skateboarding park, an internationally sponsored project which has created a safe and friendly environment where young people meet, and offering a fantastic opportunity to see what community means in Myanmar’s cities. - On your heritage tour of Yangon, see a donor-funded ‘living restoration’ project, where one of the city’s beautiful old buildings has been restored to its former glory with the active participation of its local inhabitants, and employing and training local workers. - At Inle Lake, the tour will take in the small workshops of silk weavers and silversmiths, where your contribution can directly help the local economy. - An offering will be made to novice monks at the Mahagandayon Monastery near Mandalay, giving a deeper understanding of this large Buddhist community, and contributing to its upkeep, as well as local schooling. As a company, we also regularly donate money and gifts to monastic schools at various locations around Myanmar (a monastery education is often the only kind available in many villages around the country).